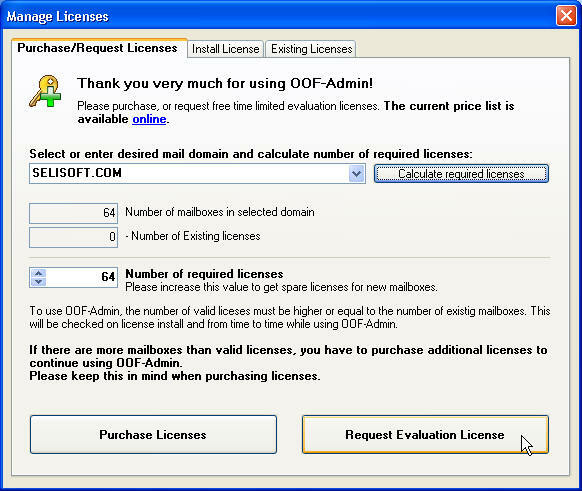 Select or enter the mail domain which users you want to manage and click Calculate required licenses. OOF-Admin will now count all mailboxes that have the selected domain in the mail address. The counted number is the minimal number of licenses you have to purchase. Increase the number of licenses to get spare licenses for new mailboxes and click on Purchase licenses or Request evaluation licenses. 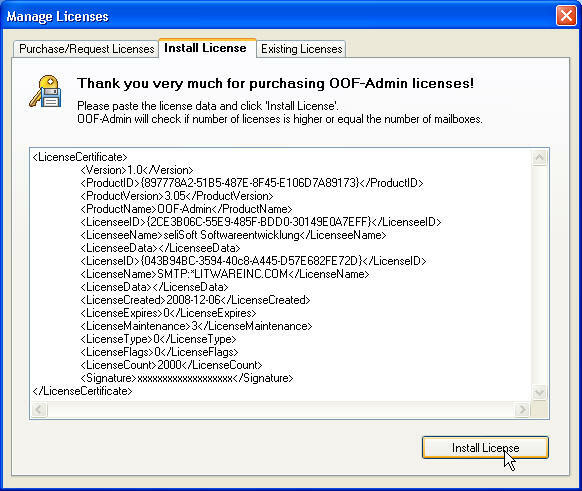 OOF-Admin will not work, if you have not enough licenses for all mailboxes. OOF-Admin will now start your browser and navigate to secure online order pages or will submit the evaluation license request to seliSoft. You will receive your license file within 1-2 days. Once received, you may copy and paste the content of the license file here or just copy the file to OOF-Admin installation folder. OOF-Admin will check the number of mailboxes and licenses from time to time.